It's been about a month since we've settled into our new Nashville casa. Do we miss being on the road? We miss the travels and the sights, but not the constant coordination and planning of being on the move. Do we like setting roots and being in one place? We love digging into a new community and building new friendships, but not juggling the weighty stewardship of all the stuff that comes with a suburban life: programming sprinklers, killing weeds, finding a plumber to fix leaky faucets, dusting, hunting carpenter bees in our deck rails, sorting mail, paying bills, gymnastics lessons, clogged toilets... well, you get the picture. Ahhh, the battle between those nasty pros and cons rages constantly. And the only real way we've found to squelch the back and forth is to rest in gratitude. So that's what we do, or aim to do, everyday. Some days we're more successful than others. We realized, after a few weeks of setting up shop in Nashville, that we would have to actively guard all the lessons we learned while on the road. Against what, you may wonder? Well, we've found that monotony and a sense of always being overcommitted can be some hard-core life drainers while setting roots in suburbia. and events in a matter of seconds? YOU get to step into courage everyday, dream big, and CREATE your life. You get to fill it with the things that matter to you, and you get to leave whitespace for the things that energize you. Say no to many of the good events and opportunities flying your way everyday. And make a plan to do what you're really wanting to do. So, in staying true to our goals, we're peppering our life with fun, experiences, culture, trips, nature, with daring greatly...things that decimate monotony and recharge us. Our first suburban adventure: camping at Fall Creek Falls State Park. Located about 2 hours east of Nashville, Fall Creek Falls State Park is a great place to set up some tents and live your outdoors-y dreams. and clean bathrooms with tons of hot water. 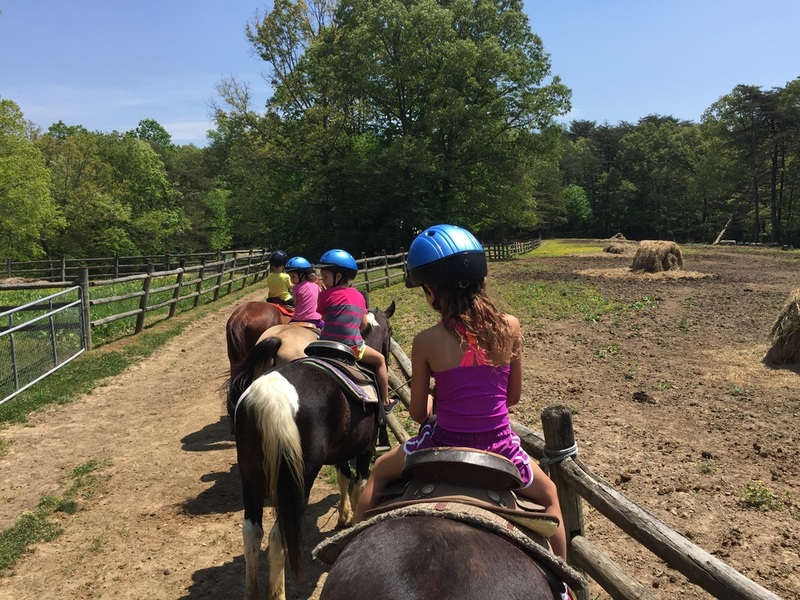 Horseback riding with kids at Fall Creek Falls. By the way, during our camping adventures, someone turned another year older...can you guess who? This little guy turned 5 on the camping trip! Adventure in suburbia is not an urban myth. Look around. Be open. It'll find you.